Will you take a stand and make a difference? Let love and mercy rule this land. Change the world for good and make a difference. You hold our lives in your hand. Based on the Scriptural book of Esther, this romantic musical drama takes place in Susa, the capital of the Persian Empire. King Xerxes, his confidence shattered in a disastrous war, lets his cunning, anti-Semitic adviser Haman run the kingdom. Haman concocts a plan to keep the king happy: soldiers will bring the most lovely virgins in the empire to the palace harem. After eunuchs have beautified and trained the girls, Xerxes will meet each one and choose his queen. Esther, a teenage orphan who dreams of the perfect Jewish husband, has no desire to join the beauty pageant. But when soldiers threaten to kill her uncle Mordecai, Esther agrees to go with them. 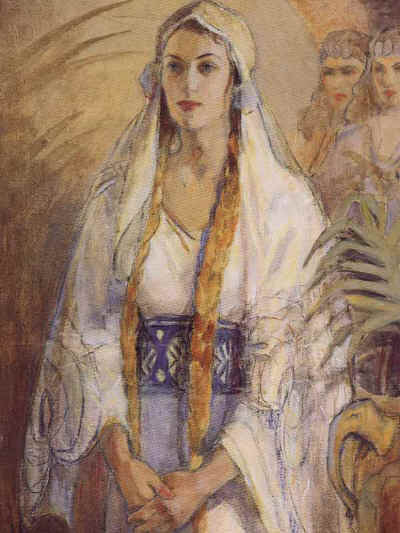 Mordecai warns Esther to keep her true identity a secret, as the Jews have enemies at court. In the palace garden, Esther meets a charming stranger called Amir. The two begin meeting secretly. Although he is not the good Jewish husband she hoped for, she falls deeply in love with him. Amir reveals that he is actually King Xerxes, and Esther is overcome with joy. When they marry, it seems Queen Esther has won lasting happiness. However, she soon learns that Haman has been poisoning the king’s mind against her people. Haman hatches a plot to annihilate all the Jews in the empire. Esther must risk losing her love and her life to reveal her identity and save her people. La Canada Presbyterian Church produced the world premiere of Esther in February, 2015.